Concrete pools represent the best and highest quality option of swimming pool construction. Apart from quality, concrete swimming pools provide the highest degree of flexibility and variety of shapes, sizes and equipment. The basic division of concrete swimming pools can be made depending on the type of circulation and the type of final lining. Depending on the type of circulation, we divide swimming pools into skimmer and overflow. Skimmer swimming pools have a horizontal water circulation in the shell of the pool and are the most common form of private swimming pools. Overflow swimming pools have a vertical circulation of water in the shell of the pool, and with this type, swimming pools with endless flow (infinity) stand out. By type of final lining, concrete pools can be divided by the following surfaces: glass mosaic, epoxy paint, PVC foil – liner. Swimming pools Radić, as a company, specializes in the construction of concrete pools, all types of circulation and final linings. We offer our customers the execution of individual stages of construction (swimming pool technique, reinforced concrete works, lining the shells) or taking over complete construction on a “turnkey” system. In each of the variants of the concrete of the pool, it is possible to also install numerous additional equipment such as underwater lighting, solar covers, water heating, counter current swimming, hydro-massage systems, waterfalls, geysers, etc. From the rich program of renowned European manufacturers of swimming pools and swimming techniques, we made sure to adopt the most modern technical achievements, taking into account the best relation of price and quality. 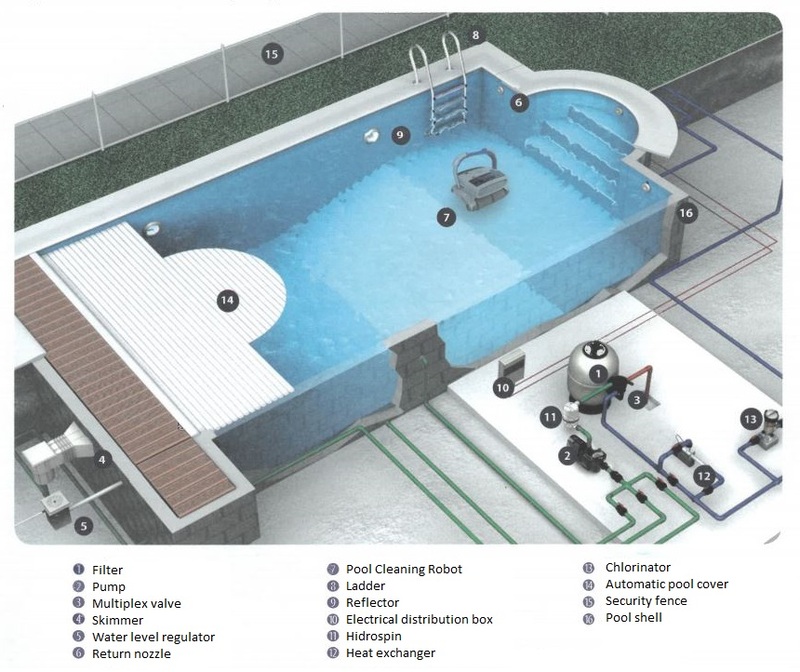 To enjoy all the possibilities that a modern swimming pool technique provides, please contact our team where you will get a precise answer to all questions in connection with the construction, maintenance and procurement of equipment for swimming pools. Construction of a swimming pool on a "turnkey" basis.